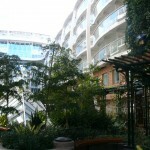 Accommodations on a grand scale on Royal Caribbean’s Oasis and Allure of the Seas. These accommodations I talk about are called cabin categories. 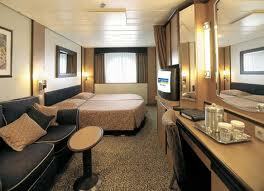 If you are not knowledgeable about cruise ship cabins, I will give you some guidance about any cruise ship. Then I will talk about how the Oasis & Allure are different. Inside cabins. Usually the least expensive. No windows. May have mirror on a wall with drapes on the sides to look like a window. If this is all you can afford, at least you are on the ship. But you will probably never book inside cabins again. Oceanview cabins have either a picture window or a porthole, depending on where they are located on the ship and are not as claustrophobic as other inside cabins. 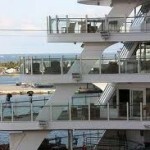 Balcony cabins have floor to ceiling window and door that opens to the fresh air and balcony. Great for quiet times away from the crowds. Suites come in various sizes and are bigger than other cabins. Some have hot tubs, mini kitchens, tables big enought for a conference, separate bedroom areas and grand pianos. Now let’s talk about the Oasis of the Seas differences. Balcony cabins that are inside but the balconies that are overlooking Central Park and Boardwalk so they are open to the sky. Aqua Theatre Suites have 6 different sizes and configurations. What they have in common are very large balconies overlooking the Aqua Theatre on the aft of the deck with glass all around. Family. Suites, balcony, oceanview, balcony oceanview and inside with all different sizes. Are you wondering what you should have? Well, that’s what you need me for- a Certified Travel Agent,to help you. Let’s talk. What Do You Want In a City?